Is there one answer to why the maternal mortality rates in the U.S. and especially Georgia so high? Is there something we are missing? Is it policy? Is it pre-existing health conditions? African American mothers in Georgia have a 66% mortality rate, compared to White mothers who are at 43.2% and Hispanic mothers who are at 18.1%. The numbers are alarming. To put it in perspective, African American mothers are three to four time more likely to die from pregnancy or childbirth than white mothers! Unfortunately, the numbers don’t lie, and they are not improving. Many preexisting conditions such as heart disease, diabetes, high blood pressure increases the likelihood of pregnancy complications, they also have contributed to the rise in maternal deaths. Through my research, I have learned that preexisting health concerns are not the only contributing to the rise of maternal deaths in Georgia, especially among black women. WHAT ARE SOCIAL DETERMINANTS AND HOW DO THEY RELATE? Social determinants of health include the conditions in which we are born, work, learn, live, play, and age. Social determinants have the ability to impact health outcomes and overall well-being. The figure below  shows how race, psychosocial influences, and medical co-morbidities may have a bidirectional effect, along with social determinants, on maternal outcomes. Going forward, I believe that WE have to recognize the multifaceted collaboration of social determinants in the lives of pregnant women of minority status, and specifically Black women. This alone has the potential to an invoke understanding of disparities in maternal outcomes across the board. Community-based research has shown that bundling prenatal care with other services, such as doula support, specifically aimed to reduce known inequalities in social determinants has been shown to improve outcomes. In the future, long-term, prospective research will be needed to continue to explore the relationship between these factors and maternal outcomes. It is imperative that we continue on the path to recognizing the problem, talk about and bring attention to the problem, and ACT on a community-level to help solve the problem! About the Author: Brooke Blocker is a Senior Human Development and Family Science major at the University of Georgia. She is interning with BIRTHFIT Atlanta as part of her study program requirements. Brooke is planning to attend Nursing school with the hopes of working in women’s health. Over the next few weeks, we will be presenting a three-part series outlining maternal mortality and the concern that is in the African-American/Black community regarding the racial disparities in maternal mortality. In part one, we explore what the maternal mortality rate is in America and in Georgia and the growing concern for our state and country. Maternal mortality is defined as the number of deaths from any cause related to or aggravated by pregnancy or its management (excluding accidental or incidental causes) during pregnancy and childbirth or within 42 days of termination of pregnancy per 100,000 births.1 Among other developed countries, maternal mortality in the United States is climbing whereas other countries are witnessing decreasing maternal mortality rates. The U.S. ranks lowest out of all developed countries and that alone is a huge issue. Average deaths/100,000 live births by state. 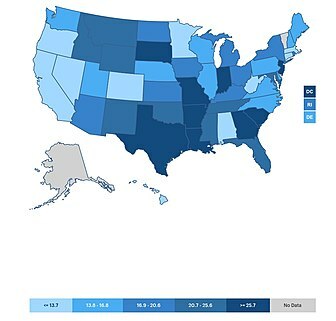 The map above outlines the maternal mortality statistics by state per 100,000 births. Along with the U.S. marking the worst maternal mortality rates among developed countries, the state of Georgia ranks the worst in the nation2. In 2018, Georgia ranked at 46.2 deaths for every 100,000 births. That is over 20% above the national average! This rate increases among different races and ethnicities, with Black women being the highest. Statistics show us that white women in Georgia are at a maternal mortality value of 43.2/100,000 births, black women are almost a third higher, at 66.6 deaths/100,000 births. In the next two blogs, I will be discussing how social determinants such as race/ethnicity, access to resources, and neighborhood characteristics impact the quality of care for pregnant women of color. I will also be discussing how as a community we can begin to tackle the issue of maternal mortality in general and among African-American women. Stay tuned for Part 2. Where do you feel stuck in your life? Maybe your career feels stuck. Or your relationships with your partner, family, or friends. Whatever it is, I don’t think I’m alone in feeling like I never seem to make progress in one area or another. At BIRTHFIT, we believe in training for birth, not just modifying what we are already doing or trying to hold onto every semblance of “pre-pregnancy” training to prove a point to yourself or others. We always come back to the “why” and the idea that just because you can do something doesn’t mean you should. Our training should reflect our intentions, and sometimes this takes some creativity as well as specific knowledge regarding effective prenatal training. That’s where BIRTHFIT comes in! I’ve always been an athlete, and I have always known that I wanted to be a mom. BIRTHFIT first caught my eye years ago because it seemed to be the perfect blend of these ideals; the woman that I am (the athlete) meets the woman that I wanted to be (the mom). I saw BIRTHFIT and thought, “I can’t wait to do this! When I get pregnant this is what I’m doing!” I’m not a mom yet, and as my heart eagerly and patiently awaits that season of life, I have discovered this profound truth: you don’t have to wait to be BIRTHFIT. Apparently, 15 to 20 percent of women who know that they are pregnant will experience a subsequent miscarriage (some sources put this number as high as 25 percent). This does not account for the half of fertilized eggs that are lost before implantation, or the number of women who thought they just had a late period without knowing she had been pregnant (called a chemical pregnancy). BIRTHFIT Atlanta supports women in the Motherhood Transition through education and training based on BIRTHFIT's four pillars: fitness, nutrition, mindset, and connection.